Let’s see, if I look at my goodreads account I am reading several books and apparently none of them are things I’ve picked up in the last two weeks. Whoops! So what am I actually reading? This is the first of what is planned to be 10-15 books in a series called The Stormlight Archive. 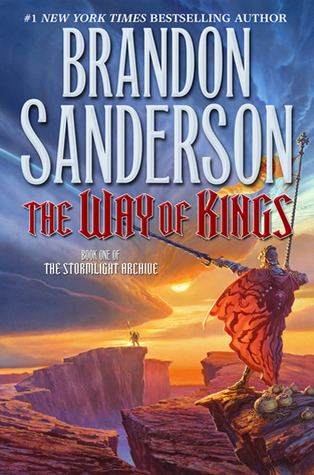 Brandon Sanderson has been thinking and writing this series since he first started writing as a teenager. Even with only one book out (the 2nd should be coming out late this year, yay!) it’s clear that Sanderson knows where he’s going and what’s going to happen and has developed his writing enough that it promises to be a great high, epic fantasy story. 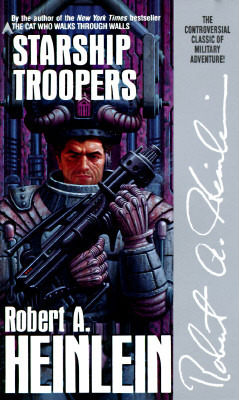 I’m actually re-re-reading it right now along with several hundred other fans through a Tor sponsored guided re-read thing where everyone gets to have details they missed pointed out to them. I’m loving it! I’m also going through my kindle copy of the book and highlighting all the things that I feel are important to reference later or beg questions that may be answered later. I’m sort of on this feminism kick and have been finding all sorts of interesting things to ponder and think about. This book has been feeding some of that interest and desire to know moar. So then what did I just finish? 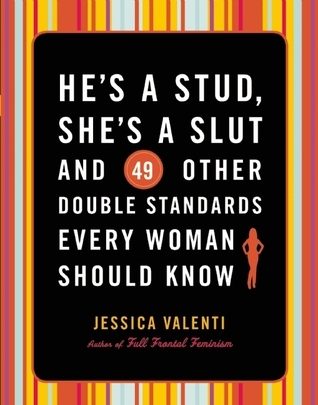 Funny I should mention Jessica Valenti. My most recent finished book was another one she published, The Purity Myth: How America’s Obsession with Virginity is Hurting Young Women. It was really eye opening. I hadn’t realized just how lucky I was to grow up in the county and state I did. It also pisses me off to realize just how much this country is being dragged backwards by people who really have absolutely no right to be determining what is best for others. But I’m going to stop here before I go all grr argh so late at night. Anywho, what’s on my to-read list? Well, I need to finish my Star Wars stuff. 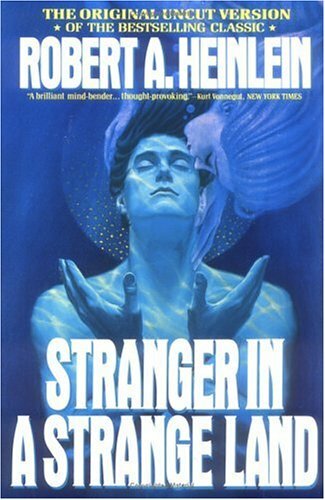 I have more Robert Heinlein to read. 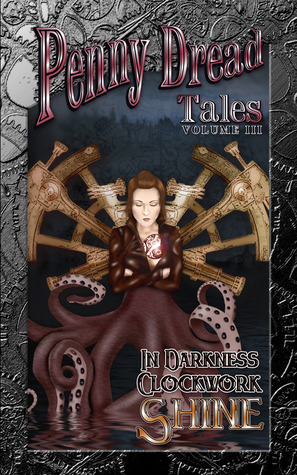 From there, I’ve got several other books on my to-get and read list including the other two Penny Dread Tales books. Yay for books! I haven’t been updating much because of one thing really. I’ve found a new obsession and it’s called Star Wars. I always liked the original trilogy. I was amused by the new trilogy. I enjoyed reading the Rogue Squadron series in high school. But I never really got into it. I was too busy with Wheel of Time and Lord of the Rings and whatever other fantasy series had captured my fancy. I sort of figured that I wouldn’t be interested in the rest of the extended universe. Leave it to my husband to disabuse me of that notion. I read what’s commonly known as “the Thrawn trilogy” in a week. Six days actually. That comes out to approximately 1,125 pages. I also encouraged, forced really, my husband to watch episodes 4-6 with me. I was doing “research” so I could make sure I had the characters and events timeline correct in my head. I don’t know that he really believes that, but it’s true! 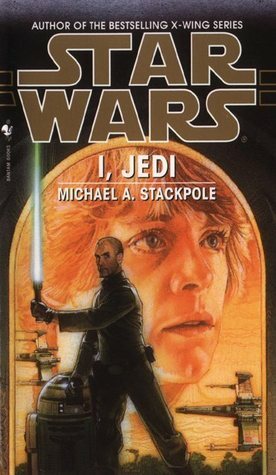 I slowed it down this last week as I caught up in such silly things as sleep and homework, and I only read the first book of the Jedi Accademy trilogy. I’m about to go on to the second book, but figured I should at least pretend like I was paying attention to this. 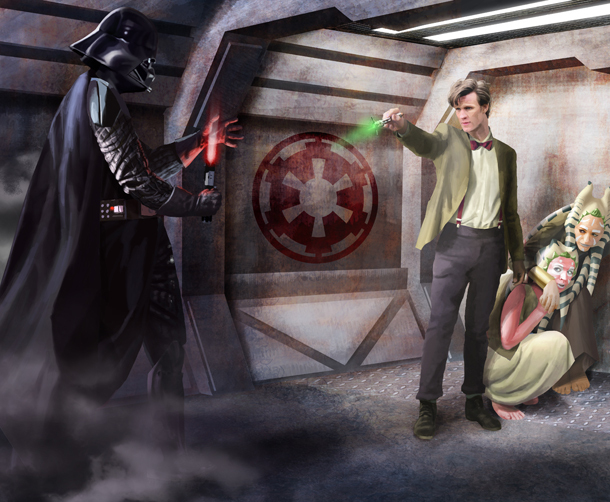 Enjoy this awesome picture and score while I go back to reading. Physical books vs ebooks. The battle has started and there are strong advocates on both sides. Physical books have texture, weight, smell and don’t run out of battery! Ebook readers mean you can carry all the books you are reading everywhere without breaking your back or shoulder, they are easy to use even if you’re standing in line, many are back or front-lit so you can read anywhere, even in the dark and did I mention you can carry hundreds of books? Both have their benefits and detriments. I personally resisted getting an ereader for years, scoffing at those who would choose to diminish their reading experience. Then I played with one of my friend’s while we were out and about and I couldn’t help but notice the convenience. When I got home and looked at the stacks of books on the floor in front of and next to my book shelves and bed I couldn’t help but think how nice it would be to not have to take into consideration whether I had space for the new books I would inevitably bring home. Thus I started to ponder whether I should look into buying one. I did all sorts of research and wasn’t really satisfied with the options nor with the pricing, but I wasn’t in a hurry either. I had dozens of unread physical books that were calling out to me and it would be silly to purchase them all over again as an ebook. Nearly a year after I began contemplating switching over I received a Kindle as a birthday gift. Initially it didn’t see a whole lot of use. Even having my Kindle linked with my husband’s account I was more interested in many of my physical books. So I would switch between them and noticed the benefits of both. The pricing for physical books was and is still better in most ways. I was paying for a physical commodity and that has more value in my opinion. I still buy the physical copy of a book if the ebook price is not at least 25% less. I get annoyed when the price is the same for both, or near enough to be a negligible difference. Unless the book I’m looking at is one that I already have in ebook form. Then I have a stronger tendency to purchase new books in the series in ebook form, though I will wait months for the price to drop. The same goes for series I already own in physical copies, I will purchase physical copies rather than ebook even if there is a price difference. Consistency apparently means much to me. As time has moved on, I’m purchasing more and more ebooks. The convenience of being able to carry a much smaller or at least less clunky device is advantageous, especially if I’m planning on going multiple places. I’ve discovered that it’s much easier to use when I’m doing cardio at the gym since I don’t have to worry about losing my page and it fits on those little “book” ledges so much easier. A simple touch of a button (or screen for those with a touch screen device) is more convenient than turning pages when I’m trying to keep from falling over or, at least want to maintain my pace, on a treadmill or elliptical machine. On the other hand, when I’m curled up on my couch and reading, I much prefer a physical copy. There’s more satisfaction in turning the pages, in the weight and even the smell of the book. I like the color contrast, it doesn’t strain my eyes as much as the back-lit screens do and I can easily read in sunlight or bright lighting. Some ereaders have addressed the contrast and screen lighting issues, but not the texture and weight and smell of real books. 1-The honor system where a reader could go to the publisher’s website and enter the ISBN number of their book and then pay and download the ebook in the format of their choice. 2-Giving book sellers little cards like what Starbucks and Apple have going on for music/shows/apps that can be given to customers with their purchase from a brick and mortar store. The reader would then go to Amazon/Barnes&Noble/iTunes/publisher’s websites or an independent website set up by a joint effort of the publishers, enter the ISBN number and one time use code and pay the fee and download their ebook. 3-For people that purchase online they would be given the option to add the ebook to their purchase and make it all one simple process to download/send to their ereader after checking out. I see this as the ideal solution as booksellers would still sell physical books, readers would be able to switch between or lend the physical book (as they already do!) and publishers would make even more money since they’d be selling the book in two formats, albeit one at a discounted price. My main argument for why that is not as much of a concern is that unlike physical books, an ebook only has to be produced one time and that file is then disseminated to the various online sellers. The publishers have less at stake if a book flops, they’ll still make more money than they otherwise would have. There will still be people who will only purchase in one format, but I think there would be enough purchasing both ways to make it worth the changes required. Since it’s not an ideal world and I must make a choice between the physical book and ebook, I must side with the ebook. It is with a heavy heart and much reluctance, but ebooks have too many more advantages over physical books. As long as I remember to charge my ereader that is!